Bangalore: Water dripping out of a flag post near a Dargah on Mysore Road was reason for much excitement on Wednesday evening as several people thronged the place to drink the `holy water’. Traffic was thrown out of gear for more than two hours and policemen were deployed to control the crowd. The `miracle’ was noticed around 2.30 pm after prayers at the Dargah Sadiq Ali Shaw Hussaini, next to the satellite bus stand on Mysore Road. A flower seller noticed water dripping out of the flag post — Gousia Nishan — and informed others. Around 4.30 pm, the news had spread and many people made a beeline to the spot and gathered in front of the post to witness the event. They carried bottles with them to take the water home. The growing crowd spilled on to Mysore Road, affecting traffic till 7 pm. Even around 8 pm, there was a crowd of around 500 persons at the spot. Dargah president Syed Najumuddin said the flag post is just three metres from the tombstone of sufi saint Hazrath Sadiq Alishan Hussain. “The saint had come to the city 200 years ago from Arabia and settled down here,” he added. Dargah board member Aleem said they had signs of a miracle happening since Tuesday night. “We were getting the scent of sandalwood near the dargah since last night. Even today, there was a dense fragrance, but we could not figure where it was coming from.” He said that as soon as they found out about the water, they informed their friends and family and soon the news spread across the city. On July 18, 2008, hundreds of people thronged the house of Babu and his wife Lakshmi in Gavipuram Guttahalli after rumours spread about a Sai Baba idol opening its eye. Police had a tough time then controlling the huge crowd in front the house gathered for a darshan. Later, it was learned Babu’s house was built on a revenue site. BBMP filed a case and got a court order to evict him. In the past, there have been other such `miracles’ like a Ganesha idol drinking milk and a bleeding Jesus idol. Waris Ali name, Makhdoom-Ul-Asfia and Sartaj-Ul-Fuqura titles, was a renowned holy man with a large number of followers, known as Warisi spread all over the country. Born on 1, Ramazan-Ul-Mubarak 1238 Hijri to Qurban Ali Shah, of Syed Hussein family, reaches his ancestor Imam Husain through Imam Mousa Kazim with twenty-six links in the lineage in between. His forefathers migrated from Neshapur five generations ago came to Devah Sheriff in India and settled there. He did not feed on his mother’s milk during daytime as an infant; neither did he take it on 10th of Moharram, the Yaum-e-Aashurah (the day Imam Husain, his relatives and friends were killed in Karbala, now in Iraq). His father died when he was three years old and his mother passed away soon after. The grandmother brought him up and sent him to the maktab (school) at the age of five, where he learnt the holy Qu’Oran by heart till he reached seven. He always carried the holy book on his head out of respect. He studied exterior subjects the Tradition and Jurisprudence from Abdul Aziz Mohaddis Dehlavi. He pledged obedience to Hazrat Khadim Ali Shah at the age of eleven that awarded him the robe of his spiritual heir at this young age. His followers and devotees objected to this but Khadim Ali Shah did not heed them. He was confident of the intrinsic knowledge of Waris Ali Shah. He traveled extensively in India. Besides, he went to Arabia, Turkey, Syria, Hijaz, Iraq, Rome, France, Belgium, Germany, and Russia, and performed the Haj at the age of fifteen. During his studies, he used to go on travails in the wilds and remained engrossed in thoughts for a few days. His obedience, allegiance, meditation, and prayers earned him a distinguished place. He was fond of music. Once he started on pilgrimage to the Haj. On the way he stopped at Ajmer. Where the annual celebration (Urs) was being held in the shrine of Hazrat Khawaja Moin-Uddin Chisti. The recital was in the offing. He too attended. It moved him to tear. Soon after he fell unconscious. When he regained consciousness, people surrounded him and requested him to admit them as disciples. He reached Constantinople and saw the Caliph, Abdul Hamid, who was greatly impressed by him. Not only did he show the path of the Righteousness to the people deeply immersed in the darkness of faithlessness in the Sub-Continent but also traveled to far off places, even foreign countries, to propagate the teachings of Islam. His efforts brought in countless people into the fold of Islam. He preached the message to the non-Muslims residing around. Devah Sheriff and changed the course of their life. He has a million names and a million forms, though He is beyond all names and forms, all adulations and attributions. The One whose stature transgresses all the limits and benchmarks set by the worldly, He often comes in response with the most viable and potent solution to his puzzles and problems. Quite often we have experienced this gentle tap from the Greater Heaven in the most unexpected, unfamiliar form. Read on for yet another story of His ‘visiting card’ born out of the pen of the illustrious Prof. N. Kasturi, as published in the Sanathana Sarathi, May, 1959. A devotee, S.R.V. 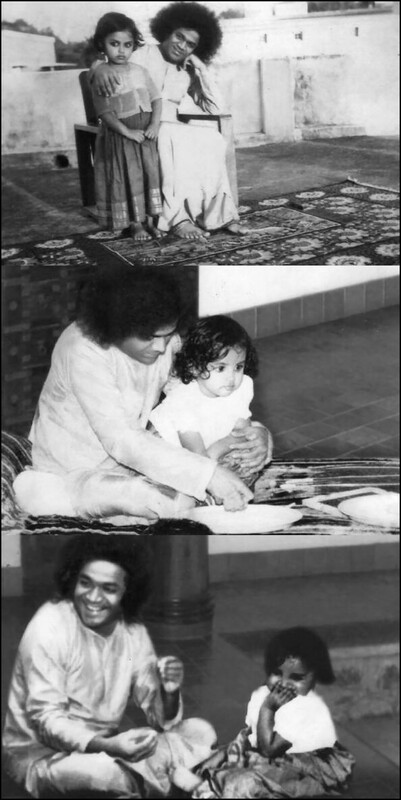 from Bangalore had come to Puttaparthi, with his wife and child, for the Birthday Festivities of the Bhagawan, on 23rd November 1958 and he left the Prasanthi Nilayam on the 25th at 12.45 P.M. taking leave of Baba, and receiving from His hands, the Vibhuti which He gets by a mere wave of the Hand, as well as a few oranges. 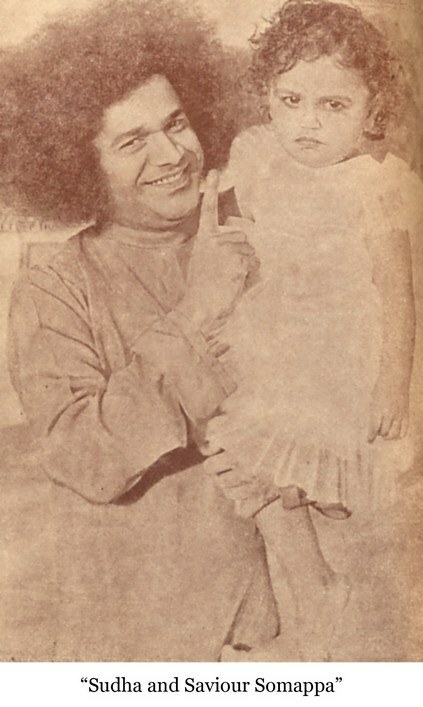 At 5:30 P.M. that evening, when some devotees gathered round Him at the Prasanthi Nilayam, Baba told them a dramatic tale of ‘death’ and ‘rebirth!’ He said that S. R. V.’s child, Geetha Sudha, called Sudha, for short, had died on the way to Bangalore at 2:45 p.m. but, He had left His body at Puttaparthi and hurried to the place and manifested Himself as an old man and saved the child. His narration was full of details and very clear and devotees who keep diaries of their experiences have recorded every word of it. He said that the child was sleeping on the back seat; that a scratching sound was heard by the mother; that when she turned she was shocked to find the baby stiff and blue and practically lifeless; that the moving car was stopped; that the time was 2:45 P.M.; that the place was between Palasamudram and Bagepalli; that a huge crowd of villagers gathered on account of the wailing; that every one was advising all kinds of remedies and cures; that a bus proceeding to Hindupur came on the scene, was stopped and added to the confusion; that as soon as the bus moved off, He appeared as an old man and demanded that the child be given over to Him, saying that He heard about the tragedy and had come running to the place; that He asked the party for a little Vibhuti, because He was sure they had it; that, keeping the child on His lap, He showed it His real form, upon which the baby, as usual on all occasions when He took the child up in His hands, cried; that He pretended to go through some curative rituals and handed the baby to the overjoyed parents; that S. R. V. thanked Him profusely for His service; that he offered to pay Him a rupee, which He refused to accept; that he pressed upon Him an Orange out of the five or six that He Himself had given him at noon while leaving Him at Puttaparthi, and that after invoking upon that fruit the calamity that had pursued the baby, He threw it away before reaching the Nilayam! We, who had heard Baba relate the whole thrilling story on the 25th evening itself, have no doubt in our minds that Jodi Adipalli Somappa is no other than Baba Himself, Baba manifesting Himself 48 miles away to save the child! Om Jodi Adipalli Somappaya Namah. . . Mysterious are the ways of the Lord. Words are of no avail, if one desires to describe Him. The mind is too feeble and instrument to measure His Glory. . . . . aprapya manasa saha!